HOLA! I'm back from an amazing 2-week visit in Guatemala! I'm feeling refreshed and grateful for all my blessings and my mind is e-x-p-a-n-d-e-d.
OK folks, I have some ideas that I'd been cooking up in my brain for months now and I'm ready to get started! FIRST is HALLOWEEN! 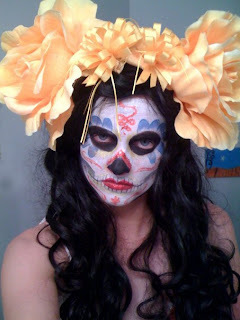 I am currently booking Halloween make-up gigs! Anyone interested in a private make-up session please contact me. I am also looking to connect with anyone throwing an (adult) Halloween party with an entertainment budget. I do glam face and body painting--I'd also be painting some gore on your guests and I even do edible face-painting. I mix and mingle with my makeup on a tray like a dragged-out cigarette girl so guests don't have to come to me, I go to them. So please pass my info on to any interested parties if you know any!